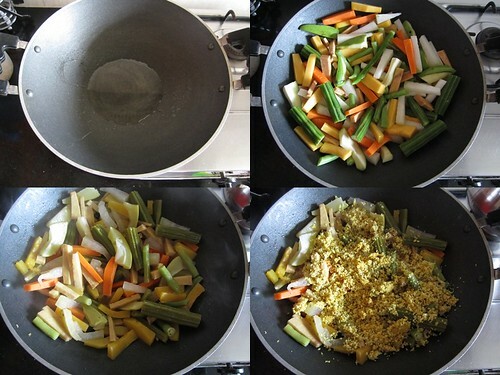 Easycooking: Aviyal ~ A medley of Vegetables!! Few people talk fondly about their canteen/mess food.My cousin S actually looked forward to her canteen food,can you believe that? ?Her school had a canteen which served piping hot food.She used to rave about the bubbling in the pan Sambhar,full of flavour Aviyal,crispy papads,a bowl of curd and it's so hot you can’t even touch kind of rice.Every morning,even if she forgot to take her books,she diligently packed her plate inside her school bag[every one were required to carry their own plates to the canteen]. For my part,as clichéd as it may sound,my school /college canteen sucked big time.Of all the years I’ve spent in the campus[almost 17 years,starting from K.G till my graduation days]I must have gone to the canteen 2-3 times,that too when I was forced to accompany some friends.It was a convent run canteen and the fish-non-veg stink was too much for me to bear.I am not being judgemental here,I have no qualms in having food along with my non-veg friends,but its just that the smell from the canteen used to put me off. 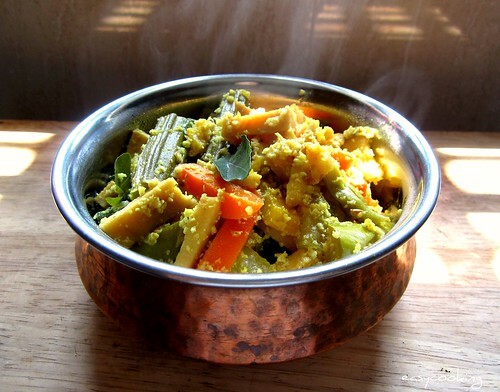 It's funny how people think vegetarians only have one sambhar and one aviyal to eat and nothing else.Many feel that we are losing out on stuff because we don’t eat non-veg. Ok,has it started to appear that I am on a rant mode-it wouldn’t be surprising if I told you that off late I’ve been showered with compliments like –I’ll run out of recipes for my ”only vegetarian blog”.So I thought I will post this life-saver dish for vegetarians;).Of course,Aparna’s post inspired me to dig out the photos of this dish from my drafts.You can read all about Aviyal’s origin and the stories associated with it here. 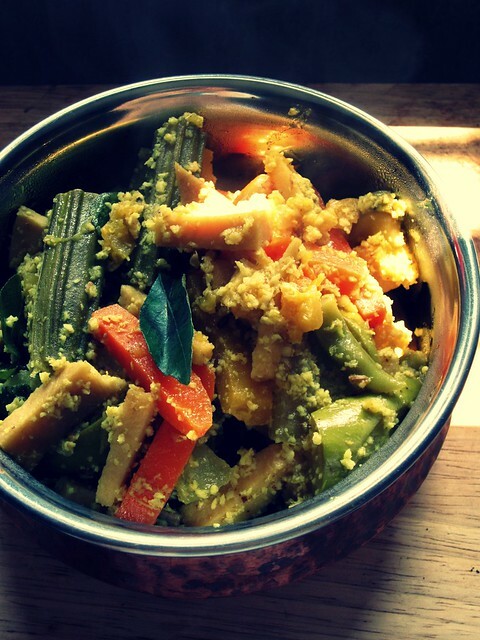 Usually,in Kerala,all Naadan-Homegrown vegetables are used for aviyal.Ash gourd/Coloured cucumber,Yam,Brinjal,Yardlong beans,Drumsticks,Raw banana,Snake gourd&Green chilly.All the vegetables are sliced lengthwise and are used in a descending order-more of ash gourd,little less yam,even little brinjal and so on. Due to the unavailability of many of these vegetables,new ones like Carrots,Beans,Potatoes etc have been added to the aviyal.As they say-anything goes into the aviyal-the more the merrier!! 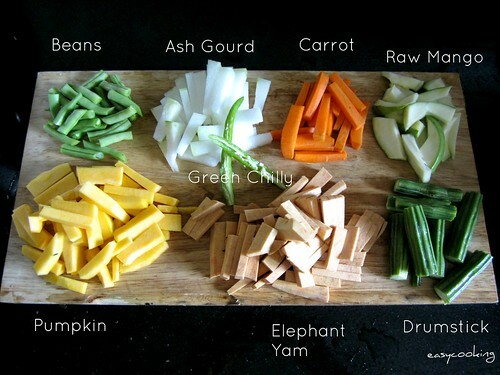 Chop the vegetables lengthwise[about the size of your small finger].Wash and keep aside. 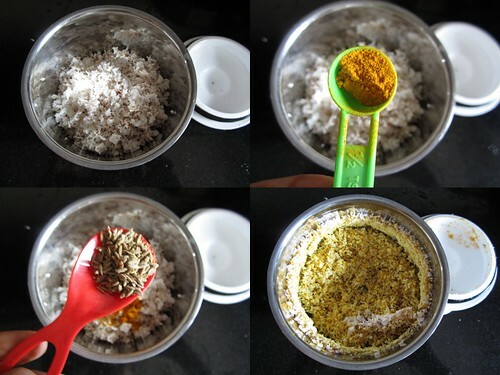 Grind the grated coconut,haldi and jeera to a coarse paste without adding water,keep aside. In a thick bottomed kadai/pan add the coconut oil and add all the vegetables into it. Keep mixing till the oil coats the vegetables. Add water-not much[about 1/2 cup should do]just enough to cover the vegetables and green chillies and cook the vegetables till soft.Take care not to overcook. Add salt and the chopped raw mango to the cooked vegetables,mix well and then add the ground paste. Spread the paste on top and cover and cook for about 5 minutes. After 5 minutes,open the lid,mix everything. Add a tbsp of coconut and fresh curry leaves. *If raw mango is not available,you can use ½ a cup of curd/yogurt. Aviyal is more of a side-dish than a gravy and the doneness is checked by the texture of the cooked vegetables coated with the ground coconut mix. Our school canteen had every day delcious hot vegetarian food, like sambhar, and two other ciurries , papadom, pickle and on special occasions there was payasom too. But then it was a company school. Avial always reminds me of onam. i love aviyal, looks grt! First time here. I heard loads about aviyal. Thought it was one complex dish to make, doesn't look like that :) I am having you on my blog-roll. Ok? One of my faves, looks delicious ! Aviyal looks healthy n delicious!